There is definetely a right and a wrong way to have a relationship. And your understanding of how this partnership you've entered really works, and how it allows both members to maximise eachother, can be deeper than you'd even realised. In a codependent relationship, the partners need eachother to be fulfilled, they absoutely rely on eachother emotionally and mentally. If they are seperated then they cannot function. Without the other person, their life is empty. This kind of relationship produces a great deal of reliance, is dysfunctional and ultimately breaks because if something happens to one partner then the other is lost. You may think, well Max, love is when you miss the other person and you need them in your life. I'd like to rephrase that. If you love the other person, then of course you'll miss them. Missing them is absoutely healthy. But NEEDING them is not the same as just WANTING them, which is far healthier. If you're in a codependent relationship, then without the other person, you are nothing. So how come when people are in love, they say things like 'you complete me'? What I'm outlining here is not the same. Codependency is a much more damaging and clingy, rather than loving need. The second type is an independent relationship. This is when the two partners spend little time together, both so focused on their own lives that they rarely have time to show love. This is just a little healthier than a codependent relationship, because the two people are at least capable of having their own lives. But it is still dysfunctional, because ultimately unless you are communicating with and showing love to your partner, things aren't going to work out. The final type is essentially the only way which is going to last, and be amazing, for both partners. In an interdependent relationship, you and your partner are synergistic. You are like two dancers choreographing with eachother. Each person respects both what their partner requires, AND what they themselves require. The partners grow together. Instead of relying on eachother, they boost and carry eachother to new heights. 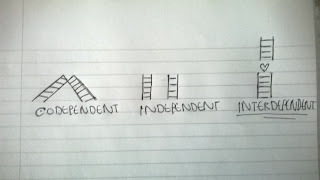 In an interdependent relationship, you are both moving up together, but you can get further because two ladders reach higher than one. 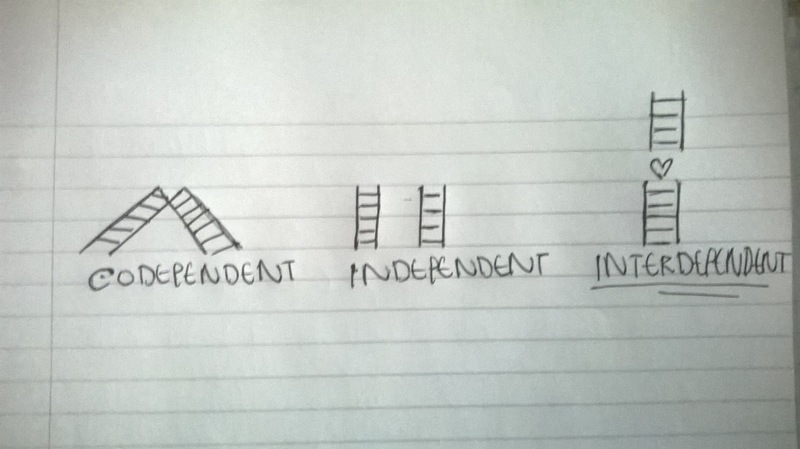 To summarise what I'm trying to say here - a relationship must be interdependent, which means it's win-win. Do not tolerate being used, because in that case your partner wins and you lose. Don't use your partner, because in that case you win and your partner loses. Be in a relationship to give, not take from the other person. When you give they will reciprocate by giving back to you. You must be patient as some people take more time than others to open up. If the relationship is not win-win, get out of it, you're better off single. Find a partner who you deserve. Don't rely on your partner, be your own person. Do not be so much invovled with yourself that you neglect your partner. DO enter a relationship to give to your partner, and grow together with them. How you should be giving is different depending on whether you are the more feminine or masculine member of the relationship, but I'll cover that in part 2.